Will China’s free-trade ports become a game changer in Asia? 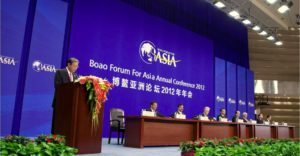 China’s plan to create free-trade ports as part of its ongoing reform and opening up could be one of the major announcements that President Xi Jinping is expected to make at Boao Forum for Asia (BFA) this week-end, South China Morning Post informs. BFA is often called Asia’s Davos and will take place on Hainan Island on 8-11 April, 2018. In his keynote speech Xi Jinping is said to give “the most authoritative interpretation” of the new measures planned to mark the 40th anniversary of China’s move towards economic liberalisation. The plan for the new type of ports was proposed by Chinese President last October when he first said the country “will give more autonomy to the free-trade pilot zones to explore ways of building up free-trade ports”. He referred to a series of free-trade ports along China’s coast led by Shanghai, for which the “higher standards of regulation on trade” will be defined, consistent with international practice in finance, foreign exchange, investment and personnel. These new rules have not been proclaimed so far, nor which ports will be granted the new status. Still, the newspaper quotes “a person with knowledge of the matter” saying “on condition of anonymity” that the new ports would enjoy much greater freedom in terms of policymaking than existing free-trade zones, for example the Shanghai Free Trade Zone, and be more open in terms of market access. “This openness will be even higher than in Hong Kong,” a second source said. They would apply international standards to ensure the free flow of goods, human resources, capital and investment. One of the locations where the new concept could be tested might be China’s southern province of Hainan. The plan is seen as potentially undermining Hong Kong’s position as a link between China and the rest of the world. Since 2013, China has established 11 free-trade zones across the country, with Shanghai being used as a testing ground for the free flow of cross-border capital and investments. We will follow this issue and will keep you informed about the developments of this concept.